WHEN RECTANGLE SUPERSEDED TRIANGLE: Britannia in ancient texts, The Venerable Bede and the Tabula Peutingeriana. There is hidden within early texts information, which if analysed, can be used to increase our understanding of early cartography. This paper considers the possible relevance of the Venerable Bede’s concept of Britannia to cartography, his comprehension of the original data, and, why that may have affected his view of Britannia. 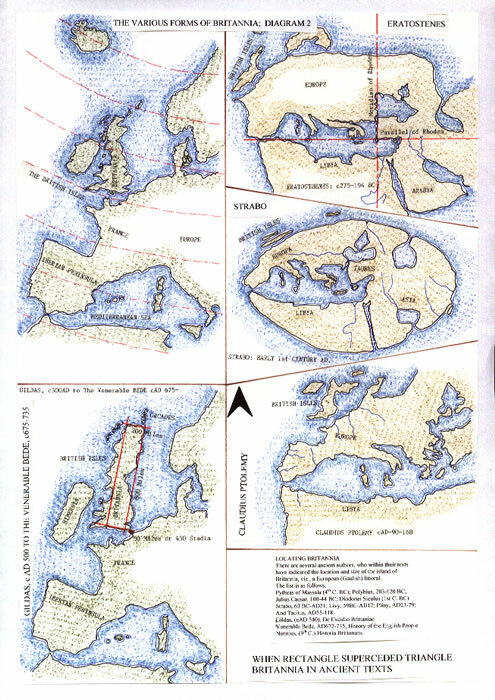 The information also provides us with an opportunity to construct an alternative for the lost portion of the Tabula Peutingeriana, at least as it pertains to Britain, and to consider the residual areas. In the sixteenth century, Konrad Peutinger, a German scholar, owned an extraordinary map or table, now known as the Tabula Peutingeriana [T.P.]. It was a single roll of parchment approximately 22 feet long and only 13 inches wide. However, it is now divided into eleven sections. From a British viewpoint it is most disappointing, the section which should contain the British Isles, the residue of France, and all of the Iberian Peninsula, is missing. The extant map or table, a medieval copy dating from around the eleventh or twelfth centuries, is probably copied from a fourth century Roman original. The dating of the original map can be made by reference to the towns and roads shown there on .The unusual method of presentation has always intrigued scholars. It is in fact a road map, a route guide containing distances between, and representations of, towns upon the major Roman roads of the fourth century. A Roman [perhaps] cartographer may have obtained from the Empire’s civil servants information on each and every road, town name and inter-distance. Although it is highly debatable whether the T.P. was constructed directly from ‘official’ data, the collation of such information could not have been without such assistance, as is argued later. It has been suggested that it is equally [if not more likely], a private initiative constructed as an amalgam of Itinerary collections, such as the “Itinerarium Antonini, [It. Ant. ], and the maps of the “oecumene” [inhabited world] such as that of Ptolemy. However, even Claudius Ptolemy was required to collect information, instead of relying upon data being provided, both official and private. This unknown cartographer then planned a single map which covers the whole Roman Empire from west to east, some 4,000KM. This would be a mammoth task even now for Geographers and Cartographers. This paper is not a discussion on what information was provided to this Cartographer. Was it in a tabulated form? Was it a proper map? Or, was it a stylized plan? Even, is it in fact the first attempt? [It would be quite an extraordinary achievement if it was, and one suspects many small maps were produced to enable this final masterpiece to be drawn.] This paper analyses data which may apply to the Tabula. One important point to be re-iterated, is, that it is not a map! It is a diagram, and is in fact hopelessly misleading to any person without knowledge of the actual shape or configuration of the real Roman World, the actual map of Europe. Thus its form could lead to some very peculiar ideas. When we look at the writings of Pliny the Elder, [1st century AD], we find that there is another amalgam of previous authors. Pliny states; Across from this location Britannia Island, famed in Greek and in our own records, lies off to the north- west, separated from Germany, Gaul, Spain and the greatest portion of Europe by a large interval. Albion was its own name when all were called the Britannias——According to Pytheas and Isidorus, the circuit is 4,875 [Roman] miles in extent. Britain is triangular in shape, much as is Sicily, but its sides are not equal. The island stretches obliquely along the coast of Europe, and the point where it is least distant from the continent, we are told, is the promontory which men call Kantion and thus is about one hundred stades from the mainland, at the place where the sea has its outlet, whereas the second promontory, known as Belerion, is said to be a voyage of four days from the mainland, and the last, writers tell us, extends out into the open sea and is named Orkas. Of the sides of Britain the shortest, which extends along Europe , is 7,500 stades, the second, from the Strait to the tip is 15,000 stades , and, the last is 20,000 stades so that the entire circuit of the island amounts to 42,500 stades. Professor Cunliffe states; Strabo says that Pytheas claimed that the length of Britain was 20,000 stades and that the island was more than 40,000 stades in perimeter [ here quoting Polybius] while Pliny quotes Pytheas as giving the perimeter of Britain as 4,875 Roman Miles , which works out at about 58,000 [sic]stades. The broad comparability of the figures given by Diodorus, Strabo and Pliny argues strongly that they must have been using the same source and that that source was Pytheas. If Britain was 40,000 stades in circumference this would work out at 7,400 or 7,100 Km, depending on the stade length adopted. In fact, both figures compare remarkably closely with the estimate of length of the coastline of Britain, given in the Encyclopaedia Britannica, as 7,580 KM. Thus the perception of Albion with a triangular shape [with a remarkably accurate length for the coast line] akin to Sicily, probably owes more to poetic license than the actual transference through the centuries of Pytheas’ description. The rivalry [ or animosity] that existed between these ancient cartographers with their commenting on previous texts, and the fact that they did not fully travel the ‘oecumene’ collecting geographical data, must account for the diverse shapes upon their reconstructed world maps. The maps of Claudius Ptolemy have a greater accuracy, illustrating that Albion [Britannia] is composed of promontories and has a basic north-south alignment. It should be noted that Ireland [Ibernia Insula] is placed some 5 ½ degrees of latitude above the Cornish [Belerion] peninsula, rather than the actual 1 ½ to 2 degrees. Therefore, during the middle period of the 2nd Century AD, the shape of Britannia on the extant maps had altered out of all recognition from those preceding. But, was Ptolemy’s map available and where did he obtain the information? Before going on to describe the maps, it is worth mentioning the sources on which Ptolemy would have been able to call. His work is considered to be a synthesis of the geographical knowledge accumulated up to his time. Living in the 2nd Century AD, Ptolemy could have drawn on a wealth of measurements recorded by the Romans in the administration of their Empire. He could also refer to many accounts of sea voyages and journeys by land, now lost. Thus the original cartographer of the T.P. in the 4th Century AD could have had more than adequate information to portray the ‘oecumene’ in any manner desired, from geographical to diagrammatic, rather like the development of the London Underground map and subsequent transportation diagrams. But, we must also allow for the limitations of the recording medium, paper, vellum, parchment etc.. Therefore we must acknowledge the possibility of ‘real’ information being available in Britain during the latter years of the Roman occupation. Or simply put, ‘from Boulogne in France to Richborough, the port of Britain is 450 stades.’ The Roman Stade is 1/8th of a mile and therefore the distance is 56.25 R M or 51.7 statute miles. There are fifteen Itinera or route descriptions, and they are represented on diagram 1. This diagram is based upon a true representation of the British Isles, thus avoiding any attempt to speculate at this stage. The Itinera details form an appendix to this paper. However, any study of those fifteen Itinera, will reveal that a road, such as the Foss Way, that great straight Roman road of myth and legend, does not appear in its entirety. In fact only the section from Venonae, High Cross, the junction with Watling Street, to Lindum, Lincoln, is within Itinera VI & VIII. Watling Street is described full length, as we perceive it, from Rutupiae, [Richborough] the gateway to Britannia, to Deva [Chester], as part of Iter II. But, Iter II is in fact a zigzag journey through Britannia, certainly not a direct route. However, perhaps for tax collectors and the like, a necessary route via some of the largest Civitates of Britannia. In fact it is hard to say why the Itinera are listed as they are, with much duplication, unless as indicated, it is the result of a collation over many years. We should also be aware that these Itinera are probably not the complete list. A study of the Tabula Peutingeriana indicates that Richborough, to Dover, to Lympe is shown as a route, but it is not an Iter route. Moreover the investigation of Kentish roads by the acknowledged expert, Ivan D Margary does not indicate that Peutinger routes, are in fact those likely to have been used from the original invasion ports. [Margary 1a, 10, 12, and 131 refer.] But, we can at least use all of the information, as the differences are no doubt of omission primarily from an artistic and presentational perspective rather than lack of knowledge. It would have been impossible to indicate upon the T.P. each and every known Roman road of the 3rd. century AD, even if all the information was available. There is also the peculiarity of the extant section of the T.P. for ‘Gaul’, being expressed in Leagues, rather than Roman Miles. Thus the Tabula Peutingeriana must have had other source material quite divergent from that of the It.Ant, but, possibly including it as general data. 1) Book One; Chapter 1; The situation of Britain and Ireland: their earliest inhabitants. Britain, formerly known as Albion, is an island in the ocean, lying towards the north west at a considerable distance from the coasts of Germany, Gaul, and Spain, which together form the greater part of Europe. It extends 800 miles northwards, and is 200 in breadth, except where a number of promontories stretch further, so that the total coastline extends to 3600 miles. To the south lies Belgic Gaul, to whose coast the shortest crossing is from the city known as Rutubi Portus, which the English have corrupted to Reptacaestir. [Richborough] The distance from there across the sea to Gessoriacum [Boulogne], the nearest coast of the Morini, is fifty miles, or, as some have written, 450 furlongs. On the opposite side of Britain, which lies open to the boundless ocean, lie the isles of the Orcades [Orkneys]. 2) In old times, the country had twenty-eight noble cities, besides innumerable strongholds, which also were guarded by walls, towers, and barred gates. 3) Ireland is the largest island after Britain, and lies to the west of it. It is shorter than Britain to the north, but extends far beyond it to the south towards the northern coasts of Spain, although a wide sea separates them. 4) Ireland is far more favoured than Britain by latitude, and by its mild and healthy climate. 6) Chapter 3; —-, and brought the Isle of Wight under Roman rule. This island lies off the south coast of Britain and is about thirty miles in length from east to west, and twelve from north to south. Six miles of sea separate it from the mainland at its eastern end, but only three at the west. 7)Book4 Chapter 16; The Isle of Wight lies opposite the boundary between the South Saxons and the Gewissae, and is separated from it by three miles of sea, known as the Solent. In these early chapters Bede quotes extensively from, Orosius, Pliny, Solinus and Gildas. Other correspondence with his good friend Bishop Daniel of the West Saxons gives us the data in 6) & 7). Habet a Meridie Galliam Belgicam, cuius proximum litus transmeantibus aperit ciuitas quae dicitur Rutubi portus, a gente Anglotum nunc corrupte Reptacaestir uocata, interposito mari a Gessoriaco Morinorum gentis litore proximo. Traiectu milium quinquaginta, siue, ut quidam scripsere, stadiorum quadrigentorum quinquaginta. Thus Bede uses the ‘Stade’ [translated as furlong] dimension, 450 stades, for the channel crossing exactly as given in the It.Ant; A Gessoriaco de Galliis Ritupis in portu Britanniarum stadia numero CCCCL. There is also the fact that Bede uses the name Gessoriaco Morinorum and the T.P. has Gesogiaco quod nunc Bononia xxiiii, which is a later Roman name change. We may therefore consider Bede’s data owes more to the It.Ant., or the tradition of itineraries, than it does to the T.P.. But, it is a synthesis of all of the data available to him in the early 8th century AD some four centuries after both documents we are considering were written and possibly available for reading and copying. But, from what data, which map, which itinerary or diagram did the Venerable Bede, and others who preceded him, conclude that Britannia was a basic rectangle 800 miles long and 200 miles wide, with promontories stretching further [ and by deduction, inlets of great distance]? This does not accord with the Graeco-Roman tradition of a triangle. But, the occupying Roman forces had surveyed Britannia! The purpose of this paper, to postulate what the Britannia section of the Tabula Peutingeriana may have looked like, is purely speculative. But, it can be seen from the foregoing that there is a consensus of agreement to the possible physical size of Britain, no doubt following the sea voyage of Pytheas. Why then did The Venerable Bede write, ‘that Britain was 800 miles long and 200 miles wide’? Could it be that, although he had a large amount of information already in the library at Jarrow, and, that he had written requesting data from other monasteries, he did not have a true map? Were the geographical maps held by the Roman authorities taken when the legions departed in the 5th century AD, and, although there was a fledgling Church in the 4th and 5th centuries, had the Clergy never managed to read, obtain, or copy that information? But if we study the information which it appears Bede may have had, the Antonine Itineraries, then, there is evidence that he was informed of, or possibly knew of the lost Tabula Peutingeriana format. Bede has read Pliny, who states “according to Pytheas and Isodorus the circuit [of Britannia] is 4875 [Roman] miles. The Roman mile of 5000 Pedes is 0.919118 statute miles and thus it is 4480 miles or 7210Km. But Bede merely gives a rectangular measure of total length 2000 miles, adding that there are various promontories and inlets, which gives a total coastline of 3600 miles, c6000 Km. This is hardly the estimates of earlier geographers, and in fact it is only 4/5ths their estimate, and certainly at variance with what the Roman Agrimensors of the occupation force would have known from their road construction program. Bede spent his whole life around Jarrow. He may have traveled as far as York and Lindisfarne. He would be aware of ‘Hadrian’s Wall’, but does not appear to be aware of the Wallsend to Carlisle build distance of 66 Roman miles. Thus it would appear that he ignored extant data and possibly concocted a series of distances for Britannia from a source or sources implying a rectangular configuration for the island. We must therefore assume Bede had a file of data, some quite contradictory, and his conclusion was based upon the most compelling presentation. That data must have stated quite clearly that the Isle of Thanet, east of Canterbury, was the most easterly point of the southern coastline, and the Roman entreport for Britannia. Bede would also have known of the Belerion promontory of Cornwall, thus including it as a text comment but, excluding it from his calculations for the rectangular shape he is determining. To have evaluated the shape of Britannia as a rectangle, even allowing for the promontory comments, Bede could not have known the true shape of the Island, neither could he establish the landscape positioning of towns, rivers etc, other than by interpolating written data, or from an indicative map which exaggerated the length and compressed the width of the island. It is therefore quite plausible to assume Bede was aware of and even had copies of Roman Itineraries and even a diagram akin to the T.P., if not an original copy of the T.P. itself. It is clear that an impression of an island, Britannia, with clear length to width proportions of 4:1 ratio i.e. 800 to 200 miles, could be the result of our ecclesiastical scribe’s access to, or being told of something like the missing portion of the Tabula Peutingeriana. However, the residue of Bede’s text requires analysis to determine the nature of his knowledge. Then perhaps we can attempt a reconstruction of the missing portion of the map. The quotations, referenced 2), and 3), taken from Bedes text are descriptions of Ireland. Our Scribe has collated information from many sources, but, even though he is an educated person, he has never left Jarrow. The world has come to him. Thus the comment regarding Ireland extending far beyond the south of Britain towards the coast of Spain is most likely to be the result of information from another source, and one who had either a strange map, or maps, and little knowledge of geography. Quite obviously the missing portion of Peutingeriana is not a prime contender for this strange map. On the extant section the south coast of Britain is indicated quite close to the coast of France. Thus on the next or missing portion of Peutingeriana , Ireland cannot be shown as extending to the geographical south, but, it can be shown to be in a southerly direction towards where the coast of Spain would be expected. By the 8th century AD, Irish Monks were traveling to and from Ireland to the Roman Catholic establishments in Europe, and to found ‘Celtic Church’ monasteries. It would not have been possible for these monks to sail to Britannia [Wales] from Cork or from the enigmatic Esgair Oerfel,[Wicklow] on the east coast, other than on a due east course. Had Ireland truly extended south, or extended to more southerly latitudes, then the course set across the Irish Sea would have been distinctly north-easterly. This would have been known to the monastic fraternity and is amply illustrated as knowledge in the tales of the Mabinogion. The Peutinger Table, the original of which is held by the Austrian National Library, Vienna, with a facsimile copy held by the British Library, thus enabling research within the UK, commences with Segmentum II. This section indicates the south coast of Britain, basically from the furthest point east, the North Foreland with the Thames Estuary to its north, then along the south coast to Exeter. Britain is fitted into the north- west corner of the Segmentum. Drawn east of Britain is the majority of France, east-wards to the Rhone valley, and Massalia, Marseille, in the south. The whole of the southern edge of the Table is the Littoral of North Africa. Although a copy, the Scribe who drew this Table has produced a feast for the eyes. It is quite beautiful in its format. The outline shown of western France at Bordeaux, has a river which will require discharging into the sea in a very short map distance when projected for the missing portion. Likewise, the Pyrenees are shown turning in a north-westerly direction. There are also two letters, I and T between Bordeaux and Toulouse. These require the three preceding letters of the actual Roman Province, namely Aquitania, A, Q and U, to be capable of insertion on the map. We must also note that there is little or no map space between Britannia and Hispania for the sea and it is quite obvious that the Mediterranean Sea is no more than a thin east-west sliver of green, [not blue], with parallel coasts for Hispania and Mauritania Caesariensis/Tingitania. The logic of the presentation of the Tabula Peutingeriana is therefore possibly three east-west strips representing Africa, Iberia and Britain. Those three strips are not equal in depth. Pro-rata from the page height of c13 inches, Africa is 3 ½ inches, Britain is 4 ½ inches and Iberia/France is squeezed in the middle at 2 ½ inches. The residual 2 ½ inches represents the seas. Surprisingly from that pro-rata exercise, Britain is accorded by far the greater map space. This is possibly just a consequence of drafting. But, as there are so many promontories and inlets, it is and was a very important island landmass, (which by the time of the It.Ant., and T.P., was providing the Roman Empire with a veritable treasure of income,) need we be surprised. Was Britannia illustrated upon the lost map in the manner of the extant second segment, by simplified wave scribbles for the coastline, paying scant attention to the major promontories, or, was this island of Britannia allotted in comparison a large map area to be shown more realistically? If it was the first map drawn, after all it does [or probably does] contain the western limits of the ‘oecumene’, and ‘the Pillars of Hercules’, then the nearly equal allotment of map space is entirely logical. The problems only occur when the mainland of Europe or more particularly the distance from the Atlas Mountains in Africa to the “Limes” of Germany require to be accommodated. This first map may have been the easiest to envisage and produce. Thus commencing with the small section of map available for study, we are able to extrapolate what can be considered a reasonable representation of the missing portion of the route map. Firstly, as already indicated, we must take into account the fact that most of France, Spain and part of North Africa are on this same sheet. By AD 300, the Roman Empire extended to the whole of North Africa, and we must therefore consider that the map may have had some agreement with reality in using a similar longitude point for both Spain and Africa. As we are speculating, and bearing in mind the magnificent efforts of the London Transport Tube mapmaker in producing the gem of route maps, we should not be surprised if Africa was somewhat altered in its westerly extent to allow a Spain which is primarily a north-south country to be fitted onto the sheet or sheets with France adjacent instead of to its north. But, we are concentrating firstly upon the British Isles, and it would be reasonable to assume that the map space which was allocated would be the whole of the long narrow east- west portion at the top, with Ireland below it. Thus, as discussed, if we have a 13 inch high map ,the diagram for Britain has a 4 inch north-south zone for its inclusion but, an indeterminate length east west on the map to plot its northerly extent. Was Britain shown as a cigar shaped island of proportion 4: 1 or 800 to 200 miles? A curious coincidence is that within the It.Ant, Dover to Exeter is just over 200 miles, and that is the extant portion of the T.P., but, it also includes Colchester, which Bede would have known was north of the Kent promontory. We should also note that the geographical east coastline indicated is shown rounded, as is the actual east coast and represents the bulge of Anglia. Thus we may question the use of the It.Ant by Bede to determine the distances. The Dover to Exeter route is covered by the Itinera III, VII and XV and when totaled as Dover/London/Winchester to Exeter equals, 59+66+90 Roman Miles, or 215 R M. Similarly, the total distance from Moridunum [Carmarthen] to Londinium [which is at the head of a large inlet] totals 220RM. From Sitomagus [? but in Anglia] to Abone [Sea Mills] also totals 220RM and is thus from the East Coast to Sabrinae Aest [Severn Estuary], another of Bede’s many inlets. The comparison is 220 Roman miles equals 202 statute miles. The width of the island, 200 miles, although indicated in the original theoretical discussion, from Richborough to Exeter as very plausible, is a little harder to further establish, as the Itinera are investigated to the north. Caernarfon to York, [Itinera II & XI]; 74 + 90 Roman miles, a total of 164 Roman miles. Carmarthen to Dover, [Itinera XII + XIIII + VII + III, or parts of] a total of 285 Roman miles. Unfortunately, the route that would probably confirm the possibility of a 200 mile mid – Britain width or measure is not available within the It Ant.. All that can be said about these Itinera is that they are intriguing because of their indirectness of journey, as we perceive the routes of Britannia. But, more importantly, they do not accord with the original Roman perception of major routes. However, we are discussing a time frame of centuries, not yesterday. But, having established a very plausible ratio of 4: 1 would The Venerable Bede have been unduly worried to search further. Was the ratio a simple author’s numerical attention grabber! For the corresponding proportionate length, it is first necessary to remind ourselves that Bede knew the Orkney Islands existed, and where they were situated. Bede was also fully aware of Iona in the western Isles, and in all probability the fact that the there was a Roman incursion north of the Antonine Wall, as far north as Montrose. From the 5th and 6th centuries monks had been traveling the highways of north Albion. This for Bede is a necessity and would have provided additional information he required, because of the limits of the Roman road network. 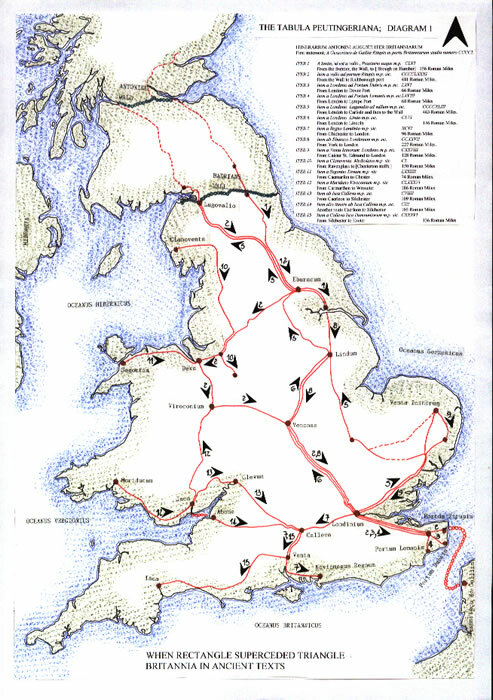 The longest route, Iter II from the Wall [Hadrian’s] to Richborough or Rutupiae is given as 481 Roman miles i.e., CCCCLXXXI, but it includes a minor mileage just north of the Wall at Carlisle. The true length is c486Statute miles to the Itinera 442 statute miles, which as can be seen from the first diagram is a tortuous journey. But let us now consider a putative map based upon the extant southern end, shown east on the Tabula Peutingeriana. From this construct, illustrated by diagram 3, it can be seen immediately that the Iter II route is nearly a direct alignment from Rutupiae/Richborough to Carlisle. Thus the length of Britain, the whole Island, suddenly becomes a very viable 4: 1 or 800 to 200 mile proportion. There is also the simple mathematics, related to the length, in that 800 x 3/5ths = 480, and the latitudinal proportion for what the Roman Agrimensors with the invasion would have perceived Roman Britain to be, when using a form of the Ptolemaic method, is more fairly described by a 3:5 ratio than the 11:20 ratio Claudius Ptolemy used in his Cosmography. At the end of the First century AD , we also see recorded the fact that [?Scribonius] Demetrius ‘grammaticus’ of Tarsus,[ a schoolmaster,] was seconded to an expedition, and, given instructions to carry out a geographical survey of the northern areas of Britain , Scotland . This expedition if it extended past the Epidium Prom. [ Mull of Kintyre] to the Western Isles, past Malaius Insula [Mull], would in fact have been sailing generally northwards, not east as the Ptolemy map indicates. Thus the information, if transmitted, as a great deal of other geographical data has been, to Alexandria, then it would surely have changed the extraordinary shape of Britannia proposed by Claudius Ptolemy from the amalgamation of many geographical works. However, we must accept that this actual map profile may never have been seen by any person in Britain. The second Iter which could be indicative of the length of Britannia is Iter V. It is from London to Carlisle, given as 443 Roman Miles i.e., CCCCXLIII, but again it is a rather circuitous route. However, Itinera II and V being somewhat circuitous do have the overall effect of confirming each other with the visual presentation of the map. It appears quite rationally that a Tabula of Britannia may have confirmed the somewhat random and circuitous itinerary routes, by visual representation. Generally the T.P. covers areas of Roman occupation only and ignores extended areas of what we perceive or determine are countries. But, the Roman Empire’s borders north, east and south are open to huge land masses, Europe, Asia and Africa. To the west we have only the boundless ocean on which there are two certain major islands. Certain that is to the Roman Authorities, Britannia and Hibernia. The latter was never part of the empire and the former was investigated by land as far north as say the Great Glen. But by sea there is the very real possibility of a circumnavigation. The T.P. cartographer, unless the lost sheet was small enough to allow Britannia to disappear off the left edge of that sheet, would have thus required illustrating an island, surrounded by sea, a known fact! Thus, even if it is argued that the author of the T.P. has not shown areas which were not occupied by the Romans on other sections of the Tabula, the minor area of north Britannia [Albion] in all probability was indicated, and quite correctly. Britannia has been given an extra-ordinarily large section of Tabula. Thus this diagram, totally speculative, indicates a possible reconstruction of the missing portion of the Tabula. It serves to indicate a rationale for Bede’s text and is indicative of the data available to the early monasteries of Britain. 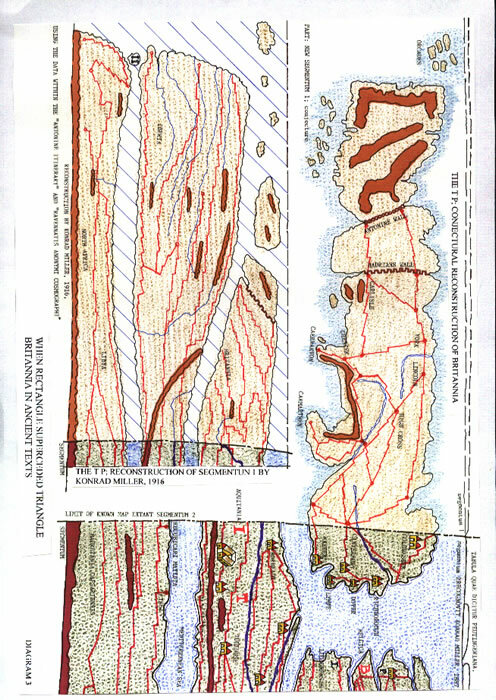 It also follows the original presentation methodology but without the artistic wave form of the original coastlines. It accentuates the coastline of Wales and provides for the major inlets and promontories. The only other island upon the T.P. to be afforded sufficient space is Sicily, but there any comparison must end. Sicily is a minor diagram when compared to that which it appears Britannia would have been. For the starting point of this reconstruction, we have more and simpler data to deal with. However, there was a curious problem to resolve. The map Segmentum II, has clearly marked Narbonne, [Harbone], on the ‘south’ Gaul coast and on the African coast of Mauritania Caesariensis, Saldas colonia. From Narbonne, the Iberian Peninsula is basically south and west, having dimensions of c450 x c450 miles. It is nearly a square peninsula. But, from Saldas colonia along the North African coast to the Pillars of Hercules is c800 miles. It would be reasonable to assume that from ‘Gibraltar’ across the straits to Tingis, the city of Mauritania Tingitana [to which it gave its name], at the south entrance of Herculis fretum, within the Ampelusia prom., there was a ‘sea’ connection. This is Tangier in modern times. Thus, perhaps the map maker would align these two points to illustrate the fact that the Roman traveler from ‘Spain’ could access North Africa, a large trading partner, easily at this point. We should also note that this is the commencement of the It. Ant., and has great historical significance for the Graeco-Roman world. It is therefore reasonable to assume that the Iberian Peninsula would have expanded to ensure the major provinces, which being well developed are adequately covered. However there is also the possibility that the Iberian Peninsula may have required greater map space and extended far to the left [north] past the rectangle of Britannia, dragging the African littoral length accordingly. The North African provinces, important as they were, are a thin littoral. The length used to portray these provinces is therefore perhaps unimportant. Thus there could have been an empty sea space to the left of Britannia, past the Orcades, and who knows what may have been shown there? But, just how far should we speculate? If Britannia is accepted as the 800 mile length, at a proportion of 4: 1, there is an automatic map length for this first sheet. It is also possible to continue the subdivisions which were appended by Miller on his apograph facsimile of the T.P., roughly at 2.5 inch centres. Four such divisions would give a perfect fit. Has the original first sheet been lost because it was a minor parchment, in physical size? It may have been just 16 inches long, with a 13 inch height. But, just how far can we speculate? Thus we may theorize that the Venerable Bede either knew of, or, had sight of, or, was informed of, the Itinerarium Antonini Augusti Iter Britanniarum, and the Tabula Peutingeriana, plus a plethora of other data, which must have had a Roman Agrimensorial beginning. Unfortunately, we have lost the original data that those Agrimensors spent years collating. However, locked within the pages of a variety of aged texts, are surprising nuggets of information? The extracts from Bede are by no means the total geographical data included there-in. Within the pages of the Mabinogion, the Dream of Macsen Wledig, Emperor of Rome, who takes to Wife, Helen or Halen, of Sarn Halen [Roman road] fame, we have the dowry request of three strongholds, Caernarfon, Carmarthen and Caerleon, and they just happen to be a rather precise 60, 90, and 120 miles apart. Many other such references are within these texts and the Histories which appeared by the medieval period. Extracting those nuggets can be an interesting experience, a look into the minds of men. We should not dismiss these fantasies so lightly, but analyze the data openly and be prepared to speculate. These texts are the link to lost data, following the destruction of the monasteries by various invaders, and, one of our own sovereigns. From the frontier, the Wall, to [ Brough on Humber] 156 Roman Miles. From the Wall to Richborough port. 481 Roman Miles. From London to Dover Port 66 Roman Miles. From London to Carlisle and then to the Wall 463 Roman Miles. From London to Lincoln 156 Roman Miles. From Chichester to London 96 Roman Miles. From York to London 227 Roman Miles. From Caister St. Edmund to London 128 Roman Miles. From Ravenglass to [Chesterton staffs.] 150 Roman Miles. From Caernarfon to Chester 74 Roman Miles. From Carmarthen to Wroxeter 186 Roman Miles. From Caerleon to Silchester 109 Roman Miles. Another route Caerleon to Silchester 103 Roman Miles. From Silchester to Exeter 136 Roman Miles. Cunliffe Barry. The extraordinary voyage of PYTHEAS THE GREEK. Penguin Books 2001. Harley J B. and Woodward , D. [eds] The History of Cartography Vol.1. Univ. Chicago Press 1987. 1990 , English edition Magna Books , Leicester. Margary Ivan D. Roman Roads in Britain , Vols 1 & 2 , 1955, Pheonix House ltd. London..
B A R British Series 359, 2003, ; Includes 86 bibliographic references. Within “Cartography and Taste in Peutinger’s Roman Map” by Richard Talbert. [lit. Verlag, Munster, 2004, Antike Kultur und Geschichte]. Page 124 states;” After first settling its intended scope, dimensions and contents, the mapmakers second step [also large] is surely to lay out the shore lines and at least the principal rivers and mountain ranges. This step demands some attention to scale, however variable and imperfect.” COMMENT; this in fact cannot be correct. The mapmaker must have coordinated, and therefore drawn simultaneously the road/town dispositions with the coast line length being determined by the requirements of the routes to be indicated. The island of Britannia and the peninsula of Italy are prime examples of this necessity. 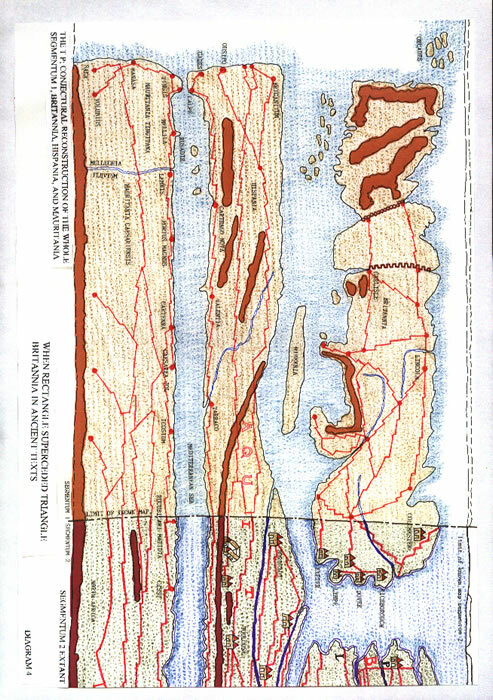 The Tabula has all the indications of being a left to right drafting exercise, and therefore it would be far more practical and a simpler drafting task if it were not constricted or restricted by preconceived coastlines.